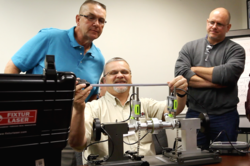 Announcing the newest video – “Secrets of Alignment” -- in VibrAlign’s “Stan the Trainer” video series, aimed at delivering common sense ideas about precision laser shaft alignment for American industry. Laser alignment tools are as dumb as a bowling shoe. VibrAlign is pleased to announce the release of the newest short video about laser shaft alignment featuring trainer Stan Riddle, entitled “Secrets of Alignment”. The “Stan the Trainer” video series is just one initiative in VibrAlign’s commitment to help businesses use their resources more efficiently and effectively. The new video can be seen on the VibrAlign Youtube channel at http://www.youtube.com/vibralign. Previously released videos include “Introducing Stan Riddle”, “ReAligning America”, “Stan Switches Teams”, “Stan on Verti-Zontal” and “Real World Alignments”. When Stan and VibrAlign’s other trainers teach alignment, they focus first on the steps that should be completed before beginning the alignment process. These “pre-alignment” steps are part of the secret to a successful alignment. Pre-alignment includes eliminating gross misalignment, controlling soft-foot, and tightening the bolts in a regular, repeatable pattern. Over the years Stan has seen a lot and learned a lot about alignment. He brings all that experience to his teaching. Stan has also been a major contributor to http://www.TheAlignmentBlog.com, and is a regular contributor to http://www.EmpoweringPumps.com, where he serves as an Industry Pro. Stan has more than 30 years of experience as a machinist and millwright, working for such companies as R. J. Reynolds, Weyerhaeuser, and Tyco. He is a certified Level III Vibration Analyst with the Vibration Institute, and is also experienced in infrared and ultrasonic inspection. Stan joined VibrAlign in 2008 as a Technical Trainer. VibrAlign started in 1983 as a vibration and alignment service organization and later became a distributor of equipment which, appropriately, equipped our team to better serve. VibrAlign is America’s exclusive distributor of Fixturlaser® – the manufacturer of the only touch screen tool available with 3D animation and sensor safeguard against sunlight. For thirty years now, VibrAlign has been growing across the country. Today we proudly operate out of local offices in every major region.